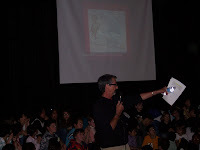 I recently had the pleasure of doing a presentation at Castlebridge Public School in Mississauga, Ontario. One of our children’s sponsors (Amedeusi) is the Chair of the School Council and I was invited to speak to the whole school at their monthly assembly about ABCD: Art Building Children’s Dreams and about Amedeusi. It was great to see Amedeusi’s poster hanging in the school foyer! 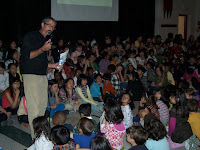 The children were from the Kindergarten to Grade Five classes and all the teachers were there too. I could definitely feel the positive energy in this school as I spoke and showed some of the dvd pictures of Tanzania and of Amedeusi. The children asked some very interesting questions about the lives of children in Tanzania, and were very engaged and attentive. This kind of cross cultural education is so valuable for our children. I am happy to report that there will be continued support for Amedeusi in the future. Asante sana (thank you) Castlebridge Public School!